Minelab GO-FIND 20 metal detector Melissa Sileo Oviedo, FL. Minelab GO-FIND 40 metal detector Curtis Locke Satellite Beach, FL. Minelab GO-FIND 60 metal detector Stephen Pittman Villas, NJ. Minelab Excalibur II 10" coil metal detector Allen Braxton Kinston, NC. Minelab CTX-3030 metal detector Ralph Smith Lancaster, CA. Minelab SDC 2300 metal detector Shawn Pryor Marianna, FL. Minelab GPX 4800 metal detector Kevin Mitchell Peabody, MA. Fisher F-11 metal detector Christine Merriam Orlando, FL. Fisher F-11 metal detector Mark Lewis Chilliwack, BC. Fisher F-22 metal detector Richard Hart Melbourne, FL. Fisher F-22 metal detector John Lewis Portland, OR. Fisher F-44 metal detector Amy Hamedl Boynton Beach, FL. Fisher F-44 metal detector Charles Ray Gilliam Rolla, MO. Fisher F75 Special Edition LTD metal detector Devin Hollander Seabrook, SC. White's Deluxe Gold Panning Kit Wayne Kotaki Kaneohe, HI. White's Bullseye TRX pinpointer Tim Stroud Kinston, NC. White's Coinmaster metal detector Virgil Akers Orlando, FL. White's MXT metal detector Gary Hotaling Union Springs, NY. White's VX3 metal detector Mark Adcock Shreveport, LA. Garrett AT Pro Diggers Special metal detector Michelle Tyndall Deep Run, NC. Garrett AT Pro Diggers Special metal detector Alfred Peterson Madison, WI. Garrett Ace 350 Discovery pack Leslie Russell Riverside, CA. Garrett Ace 350 Discovery pack Charles Braxton Kinston, NC. Garrett Pro-Pointer AT pinpointer Rita Sue Miller Winter Park, FL. Garrett Pro-Pointer AT pinpointer Roger Middleton Beattie, KS. Garrett Pro-Pointer AT pinpointer Randy Selnick Delray Beach, FL. Garrett Pro-Pointer AT pinpointer Brennen Auerbach Madison, AL. Garrett Pro-Pointer AT pinpointer Ric Coder Ione, CA. Garrett Pro-Pointer AT pinpointer James Jones Virginia Beach, VA.
Garrett Pro-Pointer AT pinpointer Johnathan Braune Little Rock, AR. Garrett Pro-Pointer AT pinpointer Neil Benningfield Haysville, KS. Nokta FORS CoRe metal detector Chris Springer Florence, AL. Nokta FORS Gold metal detector Joe Estores Kearneysville, WV. Nokta Pointer Richard Balkham Debary, FL. Nokta Pointer Kerry Christman W-B, PA.
Now announcing all thirty-five (35) winners of our Dig & Donate pull tab sweepstakes! Watch and see representatives from each manufacturuer as they pull winners at random for each prize item that they graciously donated. Thank you to everyone that participated and made this campaign such a huge success. From the manufacturers who donated over $28,000 (total) in prizes, to each and everyone that sent in pull tabs. 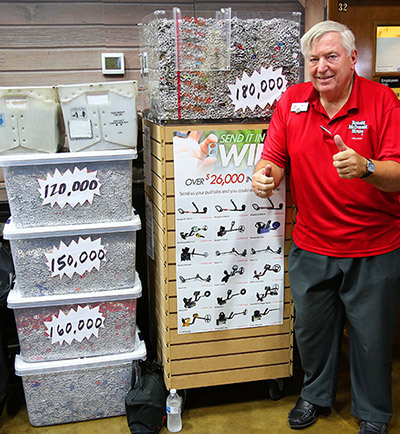 We received over 800,000 pull tabs that are being donated to the Ronald McDonald House Charities of Central Florida, Inc. So what have we done with the pull tabs you donated? Thanks to the hundreds of thousands of pull tabs that you sent in, the local Ronald McDonald House Charities of Central Florida, Inc. can now recycle them in exchange for dollars to support children and their families who stay in their Ronald McDonald House locations. Their program has helped over 20,000 local families providing a "home away from home" for families whom have children receiving medical care.